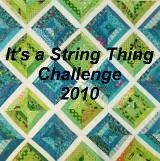 I have been having so much fun since last Friday when I took up Stacey's challenge to make string blocks. I have now completed 36 blocks for the pink quilt. Not sure how far I will go and what I will do for border or if I will just continue to make blocks. What a great Stash/Scrapbusting block this is. Hi Linda, Way to go!!! I love the darker pink blocks in the center. Very nice. It's very soft and sweet looking. Thanks. I have 64 - 6 1/2" blocks made now and I am going to sew them together soon. Thats it for my pink scraps. I used them all up! All I have left in pinks is enough for crumb quilt blocks. I will start on those after I use up all the scraps in different colours that I have by making string quilt blocks.